Support Science – Donate to My 19-July-2014 Hike Up Mt. Washington! On Saturday, 19-July-2014, I’ll be hiking up to the summit of Mt. Washington in New Hampshire. Mt. Washington is famous for its terrible weather, extraordinarily high winds on bad days, and arctic-like conditions in winter. Everest hopefuls train on Mt. Washington. Mt. Washington is also home to a number of weather-related scientific endeavors that you can explore here. The Mount Washington Observatory is manned year-round taking measurements and making climate observations of value to the scientific community at large. To help fund these efforts, I signed up as an individual hiker for the 14th annual “Seek the Peak” fundraiser. I hike. You donate. The Observatory wins. Science is better off. It’s a really simple equation. Historically, I’m not much for asking for donations, but I thought I’d try my hand at raising a few dollars for the Observatory. It’s a worthy cause, fellow geeks — it’s for science!! Click here to donate, and TIA! The view from the Appalachian Mountain Club’s Lakes of the Clouds hut up to the summit of Mt. Washington. 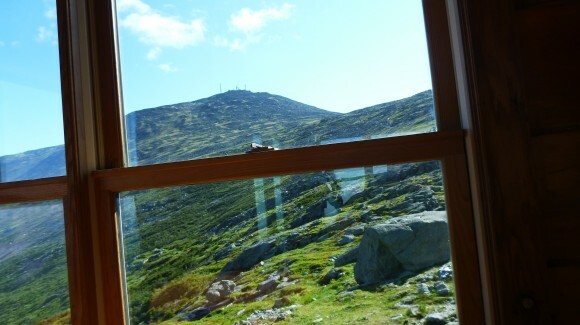 I took this from my seat at the hut breakfast table in June 2014, about 2/3rds of the way through a 9 day hiking adventure in New Hampshire’s White Mountains.